Photographer Mike Killian captured this picture of the Jan. 19 Delta 4 rocket launch from Kennedy Space Center in Florida. A launch photographer in Florida captured a photo Thursday (Jan. 19) of the gorgeous arc of a rocket liftoff reaching over a model of the space shuttle in the foreground. Photographer Mike Killian viewed the launch of an unmanned Delta 4 rocket from the Cape Canaveral Air Force Station in Cape Canaveral, Fla., at 7:38 p.m. EST (0038 Jan. 20 GMT). "The weather for last night's launch was as perfect as I've ever seen, it was quite a sight, and without a moon the stars were shining bright," Killian told SPACE.com. 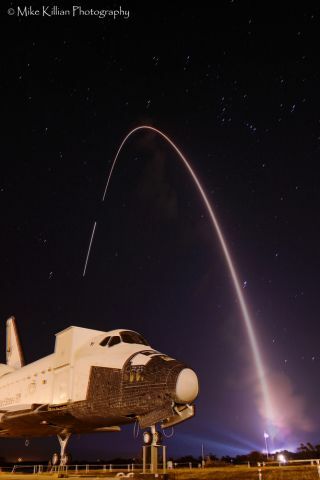 The photo was taken from the press site at NASA's nearby Kennedy Space Center, with a space shuttle mockup in the foreground. The picture is composed of two exposures: one to capture the rocket's streak, and another to image the stars, rocket plume, and the bright Xenon lights at the launch pad, Killian said. The break in the booster's streak is due to the lag time between exposures. "As a launch photographer it's rare that I ever get to actually watch launches with my own eyes, so this was special as it was the first launch I've ever actually watched without staring through my viewfinder," Killian said. The rocket was lofting a new U.S. military communications satellite called WGS-4 into geosynchronous orbit. It was the first major U.S. space launch of the year. The shuttle model seen in the picture is called Explorer, and was previously on display at the Kennedy Space Center Visitors Center. "It was moved to the press site several weeks ago to await transport to its new home at the Johnson Space Center Visitor Complex in Houston," Killian said. The model has made way for the real thing: Later this year the Florida visitors complex will receive the retired space shuttle Atlantis. Other retired shuttle orbiters are headed to the Smithsonian in Washington, D.C., the California Science Center in Los Angeles, and the Intrepid Sea, Air and Space Museum in New York.